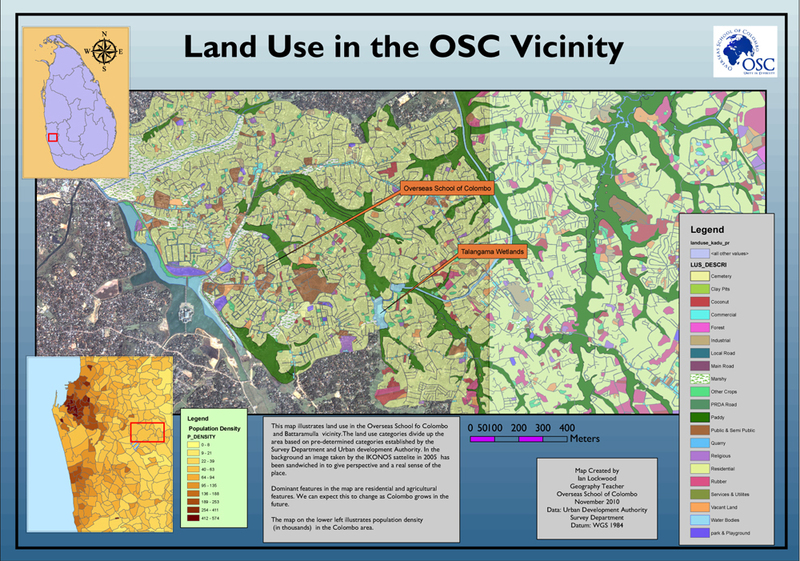 Land Use in the OSC vicinity using UDA data and IKONOS imagery. The title of this post alludes to the Rabrinath Tagore book Ghôre Baire (1916) whose central characters grapple with conflicts over Western and Indian approaches to revolutionary change in an age of imperialism. The nascent GIS program at OSC continues to make steady progress with helping students approach geographic issues from a spatial, global and local perspective. In August we received and installed the new ArcMap 10 software package with three extensions from our ESRI dealers (EMSO) here in Colombo. We also installed Adobe CS-V on all our lab computers at the same time. Both sets of software highlight the commitment made by the school and our technology department to advance student learning in cutting edge design and geospatial software applications. The Grade 10 MYP geography class has had a thorough introduction to the Arc Map software over the last quarter. I have used two of the lesson plans and data that are included in the Anita Palmer et al. book Mapping Our World Using GIS: Our World GIS Education (ESRI Press, 2009). These emphasize the process of formulating geographic questions and hypotheses and then analyzing data. This year the students have successfully used the “seasonal change” exercise which focuses on the South Asian monsoon. It fits into a larger and more detailed unit on the South Asian monsoon. In both cases the student have completed exercises and then created annotated maps that highlight their findings. The IB Diploma does not prescribe GIS skills explicitly in its most up-to-date syllabus (for exams 2011). However, the software is an effective bridge to understanding concepts, conducting analysis of geographic data and presenting raw field data. The Grade 11 DP Geography class has completed a study and comparison of population growth rates and pyramids using the Analyzing Our World Using GIS book by Robert Palmer et al. 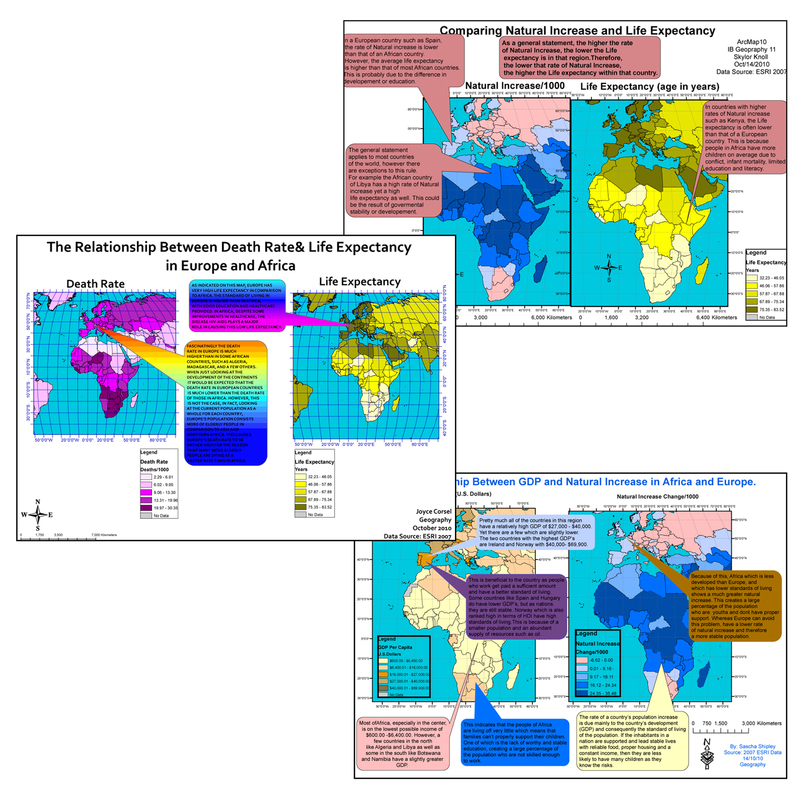 (ESRI Press, 2009). The class had earlier looked at net migration rates, economic development and other variables in Europe and Africa using the same resources. The senior class, a small batch of motivated and enthusiastic students who lead the GIS Day program last year, has effectively used our software and data in their Internal Assessments based out of Sinharaja. They have also just completed a land use and urbanization study of the neighborhood around the school’s campus in Pelawatte. The raw data for these maps was generously provided by IWMI and the Sri Lanka Forest Department and Sri Lanka Urban Development Authority. Our graduate Shamith Perera (OSC Class of 2009) interned at IWMI this last three months where he applied his GIS skills while awaiting university decisions during a gap year. 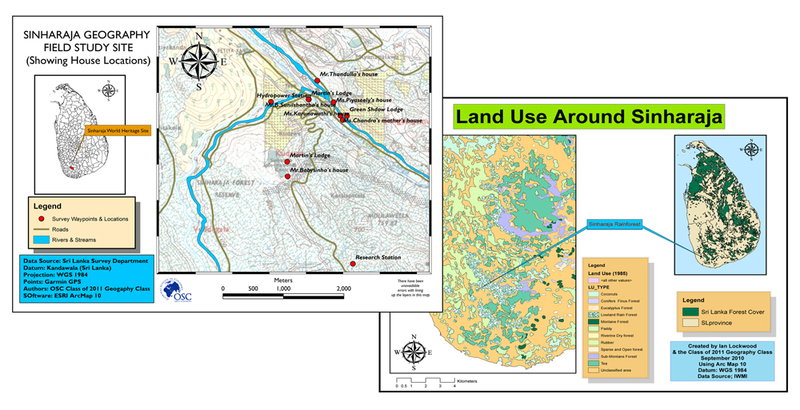 Sinharaja Geography IA maps showing study sites, land use and forest cover. A final geography development has been the recent installation of a WeatherBug weather station on the OSC auditorium roof. It is now feeding in real time weather data (temperature, humidity, barometric pressure, wind speed and direction etc.) from our Pelawatte area. The current data can be accessed on two different pages: flash (F) and metric. The installation came a week before we had record breaking rainfall on November 9th and 10th that led to extreme flooding in the Colombo area. We recorded 41cm of rainfall over a 24 hour period!